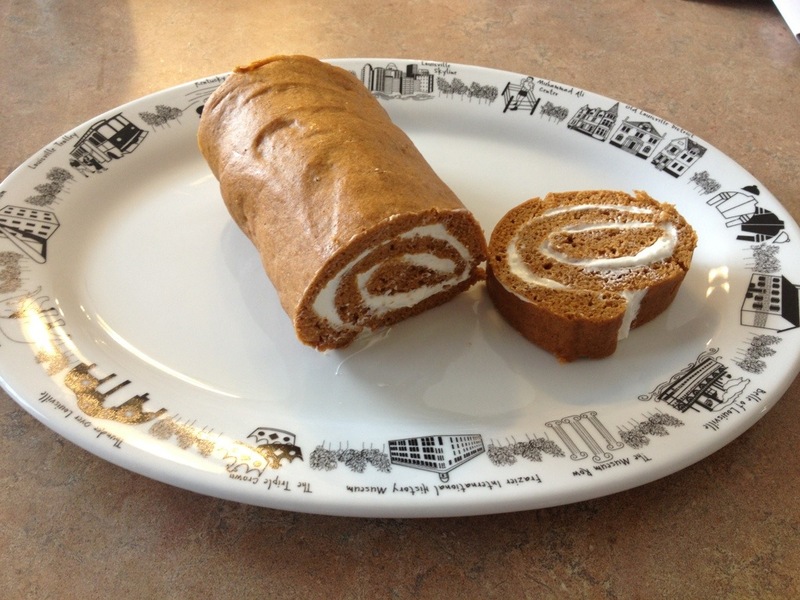 Pumpkin Roll is one of my very favorite things about the fall. In fact, my granny makes pumpkin rolls that are so good, she would make me one every year for my birthday, and I can’t think of many things I’d rather have had. You could certainly make a smaller pumpkin roll, that was full fat, full calorie, and still not too bad for you… but you wouldn’t get a very large piece. So, I’ve made this version tonight, just to see how it stood up. I didn’t have a great deal of hope. After all, my craving bar has been set high by my dear, sweet Granny. Admittedly, this version doesn’t hold a candle to hers…but it’s pretty darn good, and much lower in calories. PS: I like to eat my pumpkin rolls frozen, because that’s how she kept mine fresh until I was home from college to get it… and I couldn’t wait for it to thaw, so frozen it was…. and now that’s just the most nostalgic way for me to enjoy them. Try it! 1. In a stand mixer, or with an electric mixer, mix eggs, whites, sugar, and splenda on low for about 4-5 minutes. 2. In a separate bowl, mix Flour, baking soda, baking powder, cinnamon, and nutmeg. 3. Add lemon juice to egg mixture and stir. Then pour in 1/2 of flour mixture and mix until everything is well incorporated. Add 2nd half of flour mixture, and continue mixing until smooth. 4. Add pumpkin to the batter and stir until everything is well mixed. 5. Line a 10 X 15 jelly roll pan with parchment paper. Spread batter evenly over pan, and bake on 350 for about 13-15 min, until a toothpick inserted in the middle comes out clean. 6. Allow cake to cool about 5 min in pan. Then place a clean linen kitchen towel over the top of the cake. Carefully invert the cake pan, so the cake has fallen out of the pan, and is now lying on top of the towel. Peel away the parchment paper. 7. Hold the short side of the cake, and the towel beneath it, and carefully roll both the towel, and the cake together, into a log. Place this “roll” into the fridge to cool for about 30 min or so. 8: To make the filling: beat cream cheese, sugar, and splenda together until smooth. Add in cool whip and mix on low until everything is incorporated. Don’t over beat it or it’ll get too runny. 9. 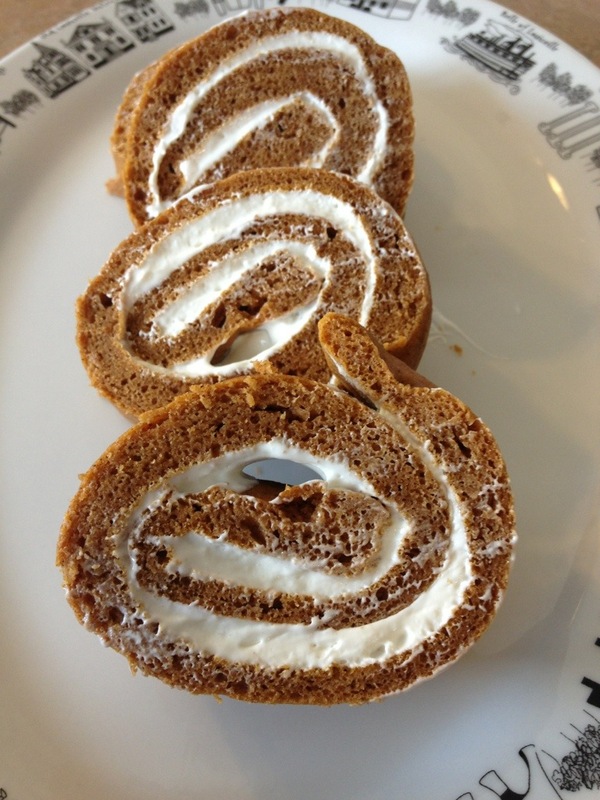 Unroll your “jelly roll” and spread the frosting evenly on top. Re-roll the cake with the filling inside (leave the towel on the counter this time 🙂 ). 10. Refrigerate at least 3 hours before serving. Or, I you eat it like I do, wrap in foil and freeze. Can you use the Splenda blend instead of both the regular Splenda & regular sugar?